Margaret Leary joined the League in 2015 but only became active in February 2017. After she learned how to give the LWVMI’s presentation about Redistricting, she agreed to be the Redistricting Education Coordinator for the Ann Arbor Area. To date, LWVAAA has presented to over 1,400 people in Washtenaw and adjacent counties. Margaret, a lawyer and librarian, is retired from her position as director of the University of Michigan Law Library. She has served on the City of Ann Arbor Planning Commission, and served three terms as an elected trustee of the Ann Arbor District Library. Cheryl Depner joined the League in 2017 and become active in the communications group this year. She has been engaged as an election inspector (poll worker) for two election cycle since 2016. She retired from General Motors Engineering after several decades of service. The national voter turnout for 2018 midterm elections, as of November 11th, is now 49.2 % which means 115.9 million people voted. That's the highest national midterm voter turnout in 52 years, which was 1966 at 48.7%. However, the number will be higher once absentee and provisional ballots get counted. We are getting closer to the all time midterm voter turnout record of 1914 of 50.4%. The 1914 record might have been higher as well if the following amendments, 19 and 26, had been part of the Constitution plus the Snyder and Civil Rights Acts passed that helped enforce the 14th and 15th amendments. Voter turnout in the State as well as Washtenaw County were closer to the presidential election of 2016 then 2014 midterm election. The State's turnout rate for 2014, 2016 and 2018 were respectively 43.2%,65.7% and 57.5%. That's a 14.3% increase in voter turnout from 2014 to 2018 and 8.2% difference between 2016 and 2018. Washtenaw county had even a bigger difference between 2014 (43.8%) and 2018 (62.7%), almost 19%, at 18.9%. We were far closer to our 2016 voter turnout at 62.7%. Who turned out to vote, old ...young.., won't be know for a few months until the demographic are known. We do know that approximately 84% of the 25,339 absentee ballots issued in the primary election were for Washtenaw voters 60 years or older per the Michigan Bureau of Elections. Speculation would be that the percentage would be about the same of the appropriately 45,000 absentee ballots issued for the general election in November. Exiting polling suggest that younger voters, women and voters of color showed up in greater number, however, exit polling is not always reliable. The final demographic will tell us the real story. Great competitive candidates, recreational marijuana, and voting rights ballot proposals push the voting numbers up in Michigan. The all-time record turnout for 1914 was at least in part due to the modification of the 17th amendment that changed the power of election of U.S. Senators from the state legislative body to the eligible voting population of every state. This year in Washtenaw county we cast 173,618 (so far) votes for governor and almost that many for each ballot proposals. Proposal 1 got 171,503, Proposal 2 had 169.342 and Proposal 3 was 169,670 votes cast. If constituents were only concerned about voting for recreational marijuana the voting numbers would have reflected that in they way they cast their votes. We were a united on how we voted on Proposal 3. Voting rights were also on the ballot in other states. Colorado and Missouri passed their proposals on gerrymandering legislation. Utah is still counting their votes but is leaning towards passing their gerrymandering proposal. Ohio seemed to quietly pass their gerrymandering proposal in the their primary this spring. Florida was voting on restoring voting rights for nonviolent felons. The measure passed with more votes in Florida's midterm election than were cast for Trump in the 2016 elections. Issues matter to voters sometimes more than candidates. Both Prop 2 and Prop 3 demonstrated that voters noticed what the legislature was and was not doing, and took matters into their own hands. In the case of Prop 2, voters noticed that their elected representatives had drawn very gerrymandered district lines and took redistricting power away from the legislature. In Prop 3, voters noticed that voting in Michigan was too difficult and that the legislature had failed to enact improvements in access to the vote by such common sense methods as straight ticket voting and an absentee ballot by right. Both 2 and 3 were constitutional amendments, which the legislature cannot change on its own. So I expect the State will take the steps needed to implement both 2 and 3. We should see improved access to voting by 2020, and Commission-drawn lines in time for the 2022 election. However there could be pushback against the Redistricting Commission. In Arizona, after voters created an independent commission, the legislature sued to undo it. In AZ case (legislature sued to prevent the new commission from getting line-drawing power;) case decided in favor of commission but only by 5-4, and the 5 included Kennedy now gone, and Ruth Bader Ginsburg. AZ Legis v. AZ Commission, 2015 Arizona State Legislature v. Arizona Independent Redistricting Commission was a 2015 United States Supreme Court case wherein the Court upheld the right of Arizona voters to remove the authority to draw election districts from the Arizona State Legislature and vest it in an independent redistricting commission. Voters evened up our congressional reps to 7-7, but state House and Senate still badly gerrymandered. As in AZ, the legislature may push back against the commission through the courts. Therefore, the LWVMI lawsuit still matters. It asks Federal court to declare present lines unconstitutional and to order state to redraw them. If successful, it will affect district lines in 2020 election. The legislature we elect in 2020 will draw the lines if litigation should hold up implementation of the Commission. 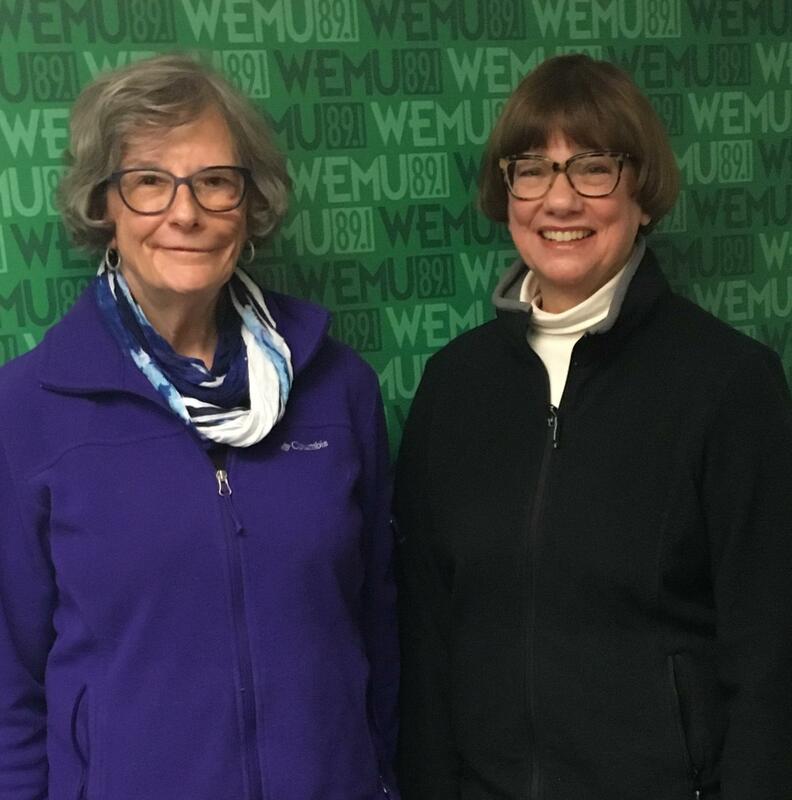 This week on "In the Public Interest" our bi-weekly conversation with the League of Women Voters of the Ann Arbor Area, 89.1 WEMU's Lisa Barry talks with league member and lawyer Margaret Leary about all the elements included in Proposal 3 voters will decide on when they vote in the coming election on November 6th. This week on “In The Public Interest," our bi-weekly conversation with the League of Women Voters of the Ann Arbor Area, we meet and talk with the winner of the student art poster contest encouraging people to vote. 89.1 WEMU's Lisa Barry talks with senior Jack Weddell and his art teacher at Ann Arbor's Pioneer High School Helen Bunch.